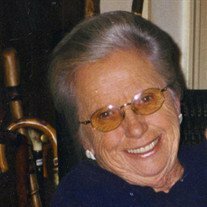 Olive"Ollie" Willson Noll, 93, of Hannibal, MO, died June 20, 2018, at her home. An artist, Olive displayed works in regional art shows and, at one time, had a gallery in Quincy. She was a member of the Hannibal Arts Council. She was a longtime resident of Pittsfield, IL, where she raised her children, and helped design sets for high school plays. She was an excellent bridge player, with a knack for easily remembering the hands, and liked to travel, especially enjoying cruises. Born March 8, 1925, in Waterville, KS, she was a daughter of John Patrick and Olive (Willson) Noll. Survivors include three sons, John T. Brass (Margaret) of O'Fallon, MO, Daniel J. Brass (Karen) of Nicholasville, KY, and Paul J. Brass of Hannibal, MO; a daughter, Louise Stauffer (Mike) of Palmyra, MO; two grandchildren, Amanda Perez-Akenzue of Benin, Nigeria, and David Stauffer of Venice, FL; and two great-grandchildren, Olivia and Loveysha. In addition to her parents, Ms. Noll was preceded in death by a son, William Brass, twin sister Louisa Mumm, and brother Charles Noll. Visitation will be 10:00 a.m. Tuesday, June 26, at Holy Family Catholic Church, Hannibal, where Ollie was a member. Pallbearers will be Dan Brass, John Brass, Paul Brass, Bob Ward, James Bridges, and David Stauffer. Honorary pallbearer will be Mike Stauffer. The family is being served by Smith Funeral Home and Chapel of Hannibal, with a memorial page and video tribute at www.smithfuneralhomeandchapel.com. Memorial contributions may be made to Holy Family Catholic Church or Turning Point Recovery Centers, in care of the Smith Funeral Home & Chapel.